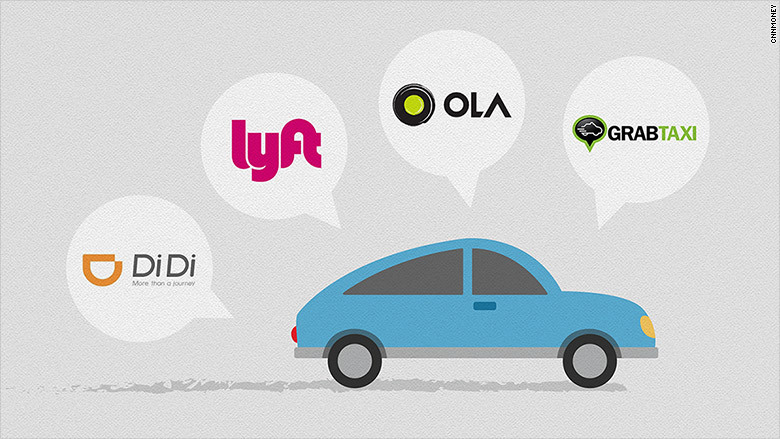 More Uber rivals are joining forces. Four ride-hailing companies from around the world announced that they were partnering in an announcement Thursday. Lyft and Chinese firm Didi Kuaidi announced a partnership in September that will make it easier to hail rides while visiting either country. Now, Southeast Asia's GrabTaxi and India's Ola Cabs are entering the mix as well. In practice, the partnership means that Lyft users can travel to China, India or Southeast Asia, hail a ride using the Lyft app, and pay in U.S. dollars. Travelers from these countries will be able to do the same in the U.S., using the other companies' apps. The partnership will start rolling out in the first quarter of 2016. Lyft cofounder John Zimmer had hinted at adding additional partners in September: "Our vision was never just about the United States ... It's just the start." Zimmer called the alliance an opportunity to make "global travel simpler," in the announcement Thursday. The four companies combined will cover nearly 50% of the world's population. Bhavish Aggarwal, cofounder and CEO of Ola, said in the announcement that it will enable the four firms to learn from each other and "build better mobility solutions in our respective markets." It also puts the companies in a better position to take on Uber, which is pouring resources into Asia, particularly China and India. All together, the companies have raised $7 billion. Uber alone has raised more than $7 billion and is currently seeking another round of financing.